Jonathan Rea sealed his tenth victory of the season in race one at Portimao in Portugal on Saturday. Jonathan Rea was in a league of his own as the reigning World Superbike champion destroyed the opposition in race one at Portimao on Saturday. The Kawasaki rider is now 95 points clear of team-mate Tom Sykes ahead of race two on Sunday, with the Yorkshire rider’s outside hopes of the title suffering a massive setback following a huge crash during FP3. 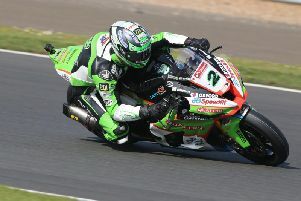 Reigning World Superbike champion Jonathan Rea holds a lead of 95 points over Tom Sykes in the standings, who has been ruled out this weekend after suffering a finger injury in a crash in practice. Sykes dislocated the little finger on his left hand and has been ruled out for the rest of the weekend. Rea, who dominated practice and qualifying, stormed clear on the ZX-10RR and controlled the race from the front, managing his pace and eventually taking his tenth victory of the season by more than six seconds from Chaz Davies (Aruba.it Ducati). The 30-year-old Ulsterman is now within touching distance of an unprecedented third successive world title. Welshman Davies’ team-mate Marco Melandri rounded out the top three after holding off Leon Camier (Reparto Corse MV Agusta) by 0.3 seconds. Michael van der Mark finish fifth on the Pata Yamaha ahead of Althea BMW’s Jordi Torres, while Eugene Laverty completed the top six on the Milwaukee Aprilia. Laverty qualified on the front row in second place but the Toome man’s pursuit of his maiden rostrum this season continues.